Because of all these things Route 66 has a uniquely American identity and it’s a significant connection to the U.S. Southwest. Before we continue, loyal readers, I’ll admit that your favorite Classy Alcoholic was not doing too well during his visit to today’s microbrewery. You see, as much as I’ve attempted to completely numb my emotions with heavy drinking and enough late-night fast food burgers that effectively act like shame-sponges I still fall victim to the occasional semblance of a feeling. And I was a bit down because I was recently dumped by a young lady I was seeing. I thought about actually skipping a microbrewery trip this week and just sitting at home in front of the Netflix with a big bag of shame-sponges and a large side of buffalo-flavored regret-pumices. But then I looked at my brewery map and saw the name “Mother Road,” located right next to historic Route 66. I thought of the thousands of people migrating away from Oklahoma and Texas on Route 66, escaping the devastation on their farmlands and heading west with the dream of a better life. My sense of adventure stirred inside me. Or maybe it was all the damn shame-sponges I ingested. Either way, I decided I needed to hit the road. I felt just like the weary travelers of the 1930s except I was better dressed, had Google Maps to guide the way and I didn’t hate black people. The white building, formerly home to a laundromat that operated from the 1920s to the late 1990s, looked a bit run-down but inviting in its own way. I’ve mentioned plenty of times that my favorite breweries are places that embrace the history and culture of the Southwest. 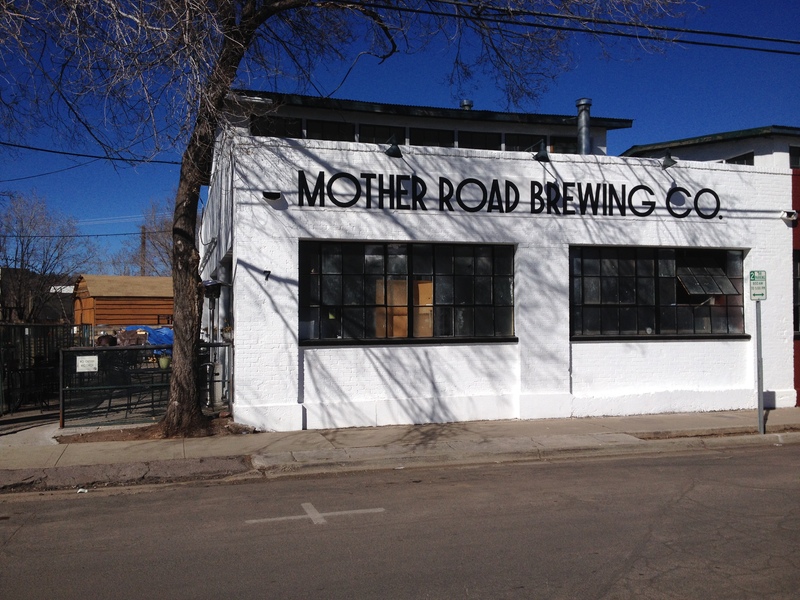 Mother Road certainly does that in name, in location and in beers. 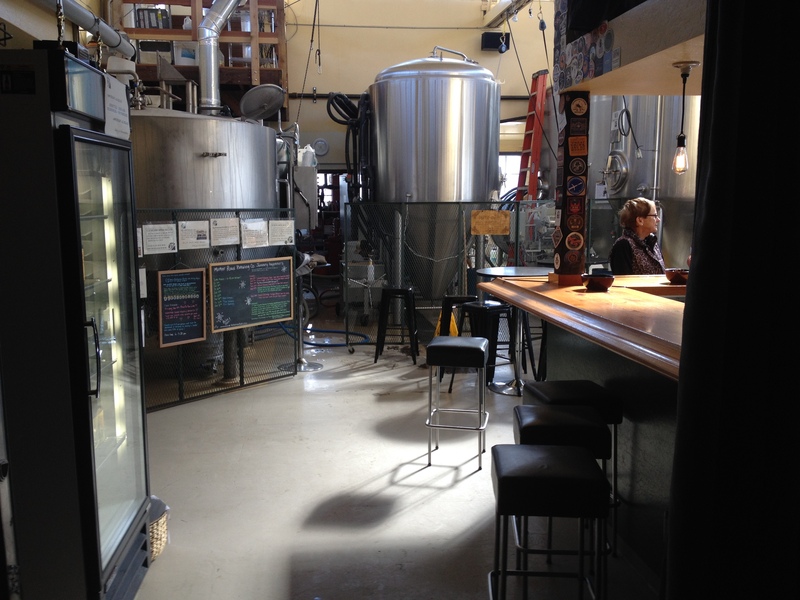 I walked into the charming tap room that had coasters from other breweries up on the walls, a merch rack with t-shirts and hats and a fridge that stored the beers that Mother Road bottled. I sat at the bar next to an older, working-class-looking gentleman. He had a full, white beard and was wearing overalls with a flat cap. “Really? What kind of name is Jom?” I asked. 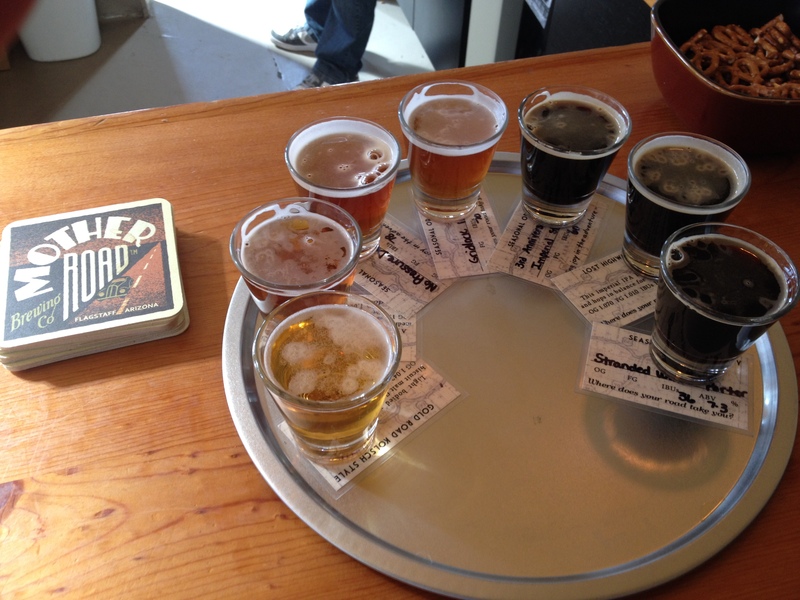 Mother Road’s flight consists of seven beers. Three were available year-round, three of them would rotate and the last was the most recent Anniversary Ale. For the last three years Mother Road has brewed a special beer to commemorate a new year in operation and 2014’s was a delicious Imperial Stout. It was a heavy beer with a bold, malty flavor and it was both on tap and available in 22 ounce bombers that you could take home. We won’t go through the three beers on rotation today because they may not be on tap by the time you get to Mother Road. But I will say that all of them were delicious, high-quality brews. 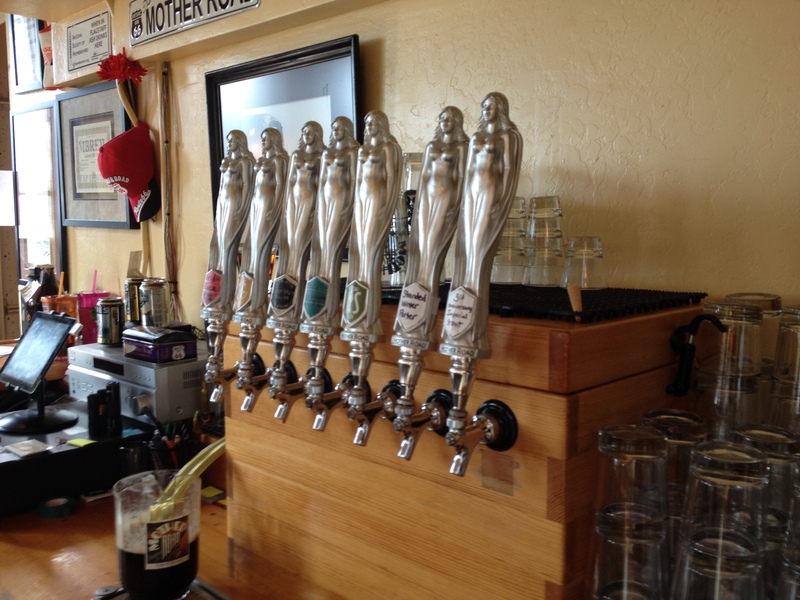 Mother Road is so dedicated to quality beer that anything they slide into those three spots is sure to be a hit. The three year-round beers are also available in bottles that you can find at your local craft-beer shop. The first was a Kolsch-Style Ale called Gold Road. It was light, smooth and had a very mild hoppy flavor to entice craft beer newbies. Jom Toad was drinking a beer called Roadside, an American Pale Ale that was also bottled and available year-round. He could tell I still seemed a little bit down. 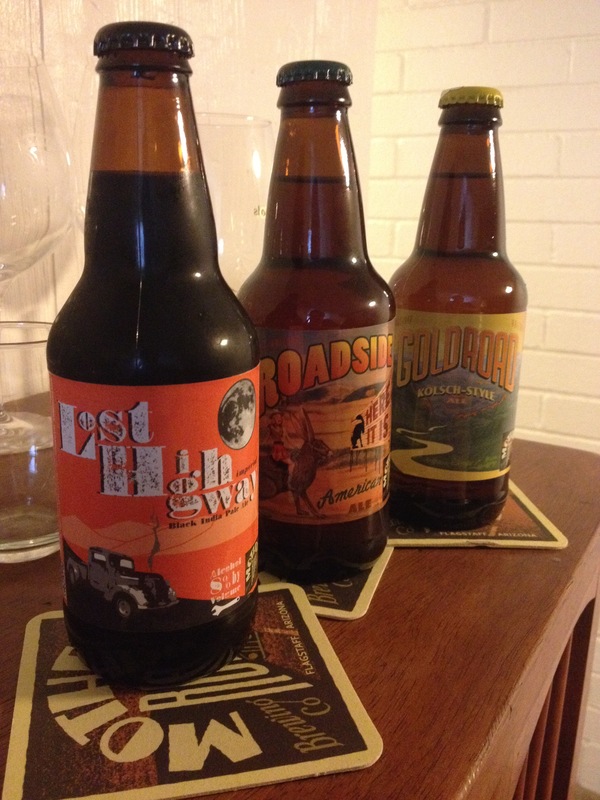 I tried the Roadside American Ale. It had a great hoppy flavor without the bitterness. It was everything a great Pale Ale should be while being smooth enough that it didn’t overwhelm the palate. This beer was a great way to introduce newbies to Pale Ales. I sat quietly for a few minutes taking in Jom Toad’s words. I knew some people would balk at what he was saying. Lots of folks were looking to settle down to build a home and a family in one place. I completely understand the desire to have the same person by your side every day. But that wasn’t Jom Toad. And that wasn’t me. He and I were travelers. And I realized that there was nothing a guy like me loved more than a new adventure. Mother Road Brewing Co. was the perfect place to remind me of that. While my actual mother was busy dodging border patrol drones and my ex-girlfriend was busy dodging my phone calls and texts I realized that Mother Road was as close as a vagabond would get to feeling like home. Until the next stop.